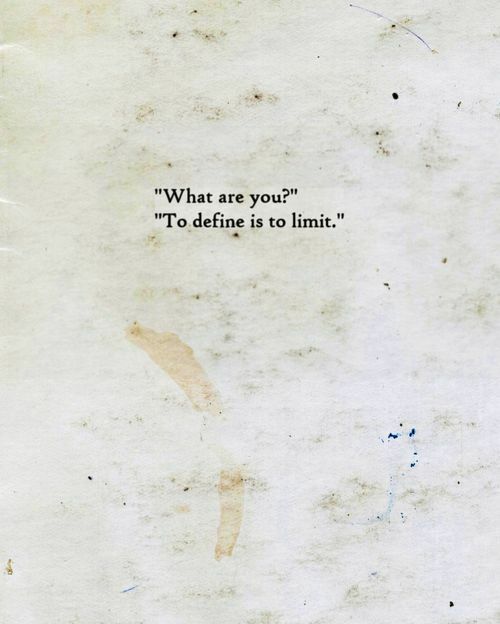 What exactly is it that defines you? Is it your family, or your nationality? Your career, or your dreams? What is that one, specific thing that defines you as a person … completely? This is what I found myself meditating on today (from my prior post, “Forget the Pose“). Early on in my life, as I suppose would be the case for most people, it was my family. When you are a child, what else is there that could possibly define you more than that? When family was taken away from me, in my teenage years, I was adrift in the vacuous void of aimless depression … so I suppose that depression defined me. In my twenties it became self-liberation and my dreams … going after the things I was passionate about, and letting nothing stand in my way. Over time what I have chosen to define me has changed several times: a couple of times it became people I fell in love with, another time it became avoiding rejection at all costs, and at one point it was religion as well. Here’s the thing though … ALL of those phases I described are exactly that … PHASES! They don’t define me any more than a Magnolia flower defines the tree. I made the decision to make them define me though … I wanted to be in control, because being OUT of control was way too scary a thing for me. Now, I am at a new place … God defines me. The old things keep clawing at my mind to find their way into control … but I don’t even have to fight them any more. Once they get in? They come face to face with a Loving and Living God within me who has lit my Soul on fire … nothing else can take up residence in that place any longer. Of course, that takes a certain amount of work as well. It’s not enough to just say that God defines you … you have to put in the work to make that reality. For me that means spending at least an hour or two with God each day. It was work for a while … now I find that I am loathe to leave God’s presence. Today was like that … an hour went by, and I automatically thought, “Okay, time to get up and go about my day.” Then I simply decided to just stay there … and spend some more time connecting with God … soaking in that Divine presence and Love. So, yeah … there still are things that try to wrest control away … home life, love, the future and all the vagueness that entails. My mind struggles to try and DEFINE something, so that I can be in control. It’s like I needed all of those things, or people, to be there to take care of me in some way … so that I could be good enough … because it is clear that I obviously have been thinking that I am not good enough, or worthy enough. THAT is something to define me … that with God at the center of my being: I am good enough … all things are possible with Love ablaze in your heart. I can let go … there is no need to fight, or cling, or push … just let go, and BE … whoever, and wherever, and whatever it is that God guides me to be.